Last week, the exhibition ‘BEL:EST A LABORATORY FOR EUROPE IN BRUSSELS’ opened to the public at BOZAR, Brussels. It can be visited for free until Tuesday the 10th of January. More information can be found on the Facebook event or on the website of BOZAR. 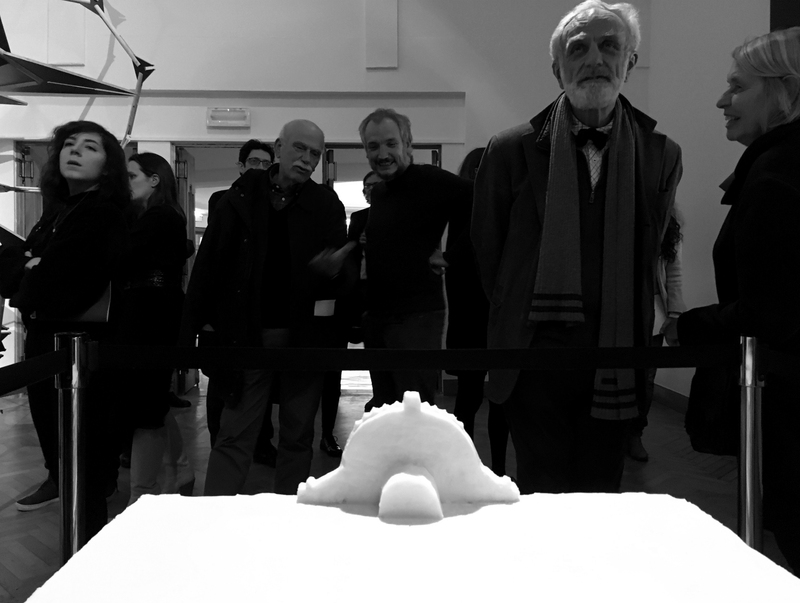 Salto Architects together with ​​BOGDAN & VAN BROECK ​present a model of a fragment of the European Parliament building made of saturated fat. The parliament building in Brussels represents the bounty of laws, directives and restrictions implemented to each member state. The decisions of different bodies that govern the EU can sometimes end up detaching people from each other in unexpected ways because of the saturation of different regulations. The fragment selected for the model is the Station Europe — the original building of the Brussels-Luxembourg train station. A beautiful historical facade to which the European Parliament complex is attached ​​and where the augmented reality model of the European Parliament campus is kept. The installation made of fat​,​ questions the balance between the security area and the comfort zone, and the possibilities of preserving them both in general as well as on European scale​.